This is part one of a two-part interview. Follow this link to read the second installment of the interview. In the U.S. we can talk about cancer, asthma, heart disease (or most any other disease, frankly) without worry of recrimination. Can the same be said for talking about a mental illness diagnosis? 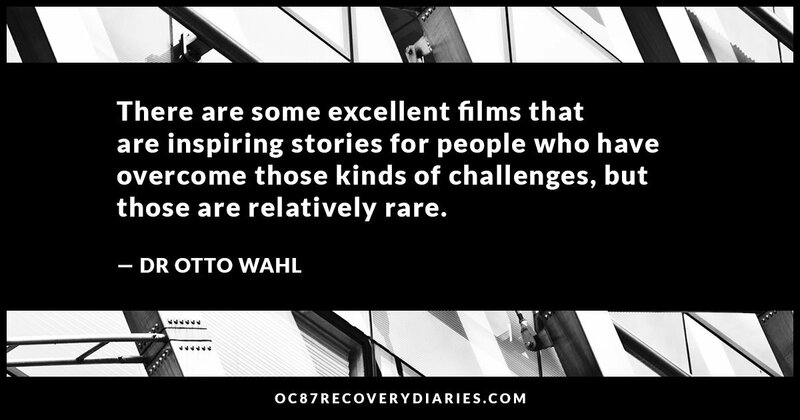 OC87 Recovery Diaries was formed to tackle stigma. We are well aware that although there has been progress, stereotypes, prejudices and discrimination still exist. At its core, stigma is a fundamental lack of knowledge and misinformation about people who live with mental illness. More often than not, the media tends to confuse — rather than educate — the general public on matters of mental health, and stigma ensues. 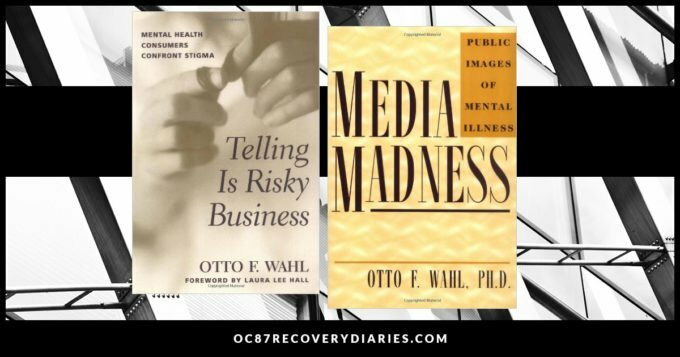 One of the pioneer researchers about media, mental illness and stigma is Dr. Otto Wahl. He is the author of two ground-breaking books on the subject: Media Madness: Public Images of Mental Illness, which describes and discusses the stigmatizing ways mass media present mental illnesses; and Telling Is Risky Business: Mental Health Consumers Confront Stigma, which contains personal accounts of stigma and discrimination experienced by those with mental illnesses. Dr. Wahl is a recently retired professor of psychology at the University of Hartford. He was an early advocate of speaking out about lived experiences as a method for combatting stigma. GLENN HOLSTEN: Could you tell me about the origins of your academic study? What got you interested in this field? DR. OTTO WAHL: In graduate school I was very interested in (and did my dissertation research on) schizophrenia, which is, of course, one of the more severe mental illnesses. In the course of my research, it became more and more apparent to me how much misunderstanding there was about this disorder and how badly people talked about it — including mental health professionals. And because I am a member of the TV generation, and I was also interested in the kinds of things that I saw in TV and film about mental illness. As I was learning about mental illness, I was also seeing how they were inaccurately portrayed on television and how those portrayals fed misconceptions. So, I began systematically studying them. GLENN HOLSTEN: How would you qualify the misconceptions, what was the media’s image of mental health especially schizophrenia? DR. OTTO WAHL: There are several that have persisted over the many years that I have been doing this work. One of them is that people with mental illnesses, especially severe mental illnesses like schizophrenia, are prone to violence and criminality. That is probably the most common media stereotype and it remains today. GLENN HOLSTEN: Why do you think it’s lingering so much as we’ve gotten more informed about things? 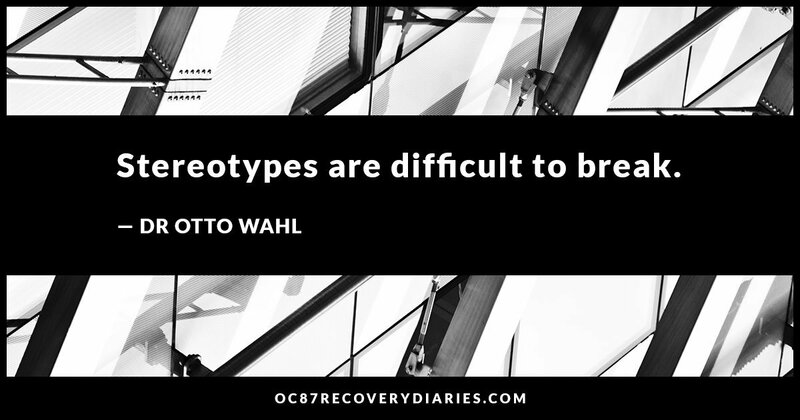 DR. OTTO WAHL: Well, one, stereotypes are difficult to break. Two, it’s a great plot element to create fear and danger and to put your audience on the edge of your seat, to feed into the stereotypes that already exist about how dangerous such people are. It perpetuates itself. 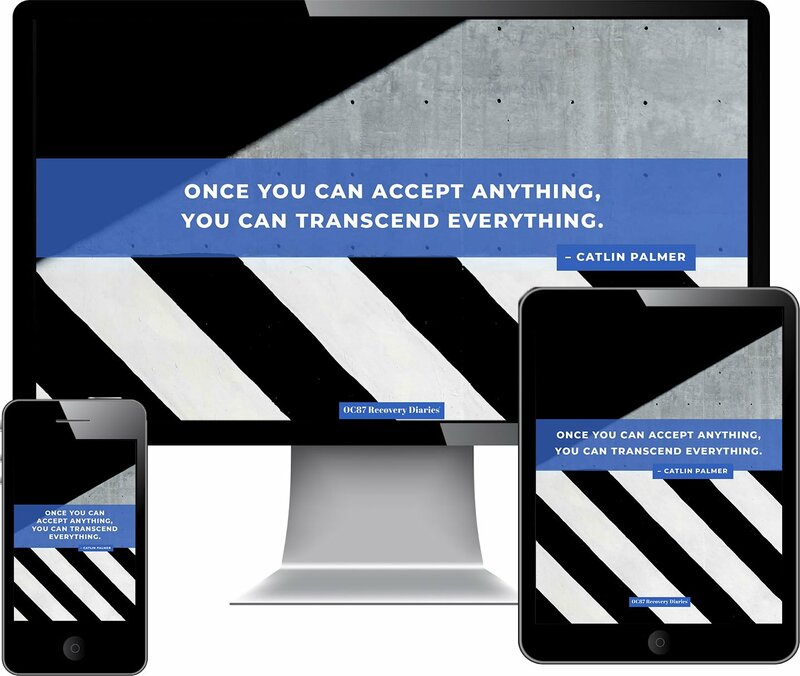 It occurs on screen because it is effective in tapping into what people already believe, and then people believe it even more so because they continue to see it as that stereotype. GLENN HOLSTEN: That’s a very good explanation of it. I think you’re 100% right about that. DR. OTTO WAHL: It is kind of a short cut for putting people on the edge of their seats. You don’t have to explain people’s motives, you just say they have schizophrenia so of course they’re doing these things. GLENN HOLSTEN: I’m curious about how you go about studying something like this. Your book was published in 1995. What kind of research did you have to do to gather all your information and make your conclusions? DR. OTTO WAHL: When I wrote that book, there wasn’t much empirical research. I looked at what empirical research there was in writing the book and added just a little bit of my own. Since that time, we’ve been collecting more data — as have many other people. Basically, what you do is you do content analysis of various media, of television, of film, of newspapers, of books. GLENN HOLSTEN: What was the reception when you first published your book, and why did you continue to work in the field? DR. OTTO WAHL: Long before I wrote the book, one of the first articles that I had published was a not scientific article, it was an article published in TV Guide magazine. 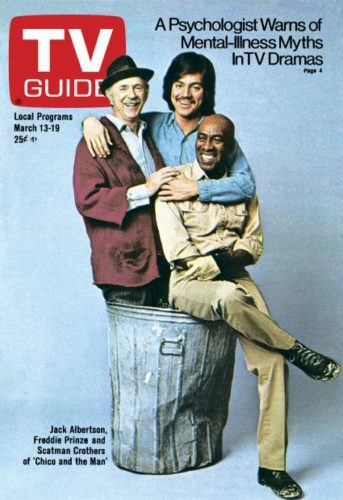 GLENN HOLSTEN: I remember TV Guide! That’s one of the things that motivated me to continue with this research. I had a similar response to the book when I wrote it. There were people — people with mental illnesses in particular — who said to me that this is an important topic for people to pay attention to. GLENN HOLSTEN: Interestingly enough, have you written other books on this subject? 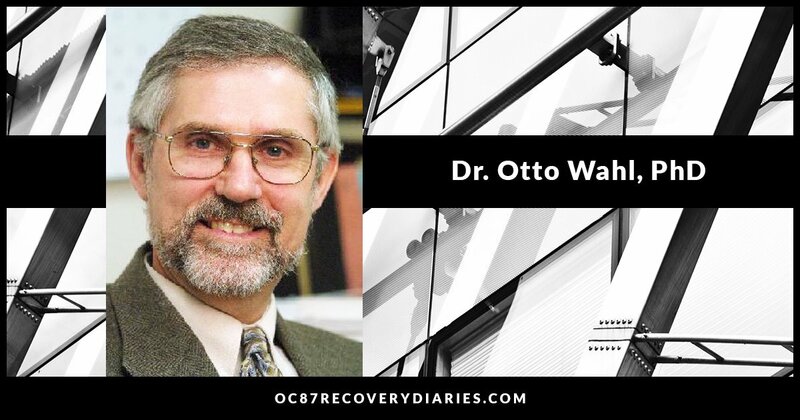 DR. OTTO WAHL: I’ve written two books. One of them was about this and one of them was on a related issue, the title is called Telling Is Risky Business: Mental Health Consumers Confront Stigma. I was motivated by feedback that I got from people with lived experience of mental illness. I would talk frequently at conferences and other places about stigma. People in my audiences sometimes came up and said, “Look, if you really want to understand stigma, you need to talk to the people who experience it.” We did an extensive nationwide study surveying people with mental illnesses about their experiences of stigma, what we learned from them is the basis of that second book. For that study, we went out and asked people with mental illness what their experiences of stigma and discrimination were and tried to document the daily life experiences of people. It’s one thing to say that people are stigmatized and then they’re discriminated against, but a lot of times we don’t really have a good concrete grasp of what that involves. GLENN HOLSTEN: When you were researching your second book, did you uncover any big surprises? 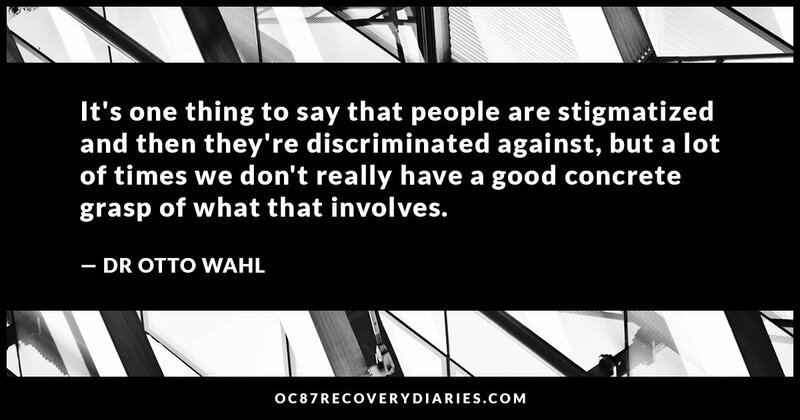 DR. OTTO WAHL: Even though I knew a lot about stigma, I was still surprised and appalled by some of the experiences that people described. It’s hard not to be. GLENN HOLSTEN: Can you give me any idea of the breadth of the depth of how stigma impacted the lives of the people you interviewed? What kinds of stories amazed you? DR. OTTO WAHL: People recalled stories of how they could not even get proper medical attention because their medical complaints were not taken seriously, that their medical needs were seen as just a by-product of their psychiatric illness. One woman talked about walking on a broken foot for months before her sister intervened and got somebody to x-ray it. People told me about the experience of going back to work after recovering from a psychiatric hospitalization to find that their coworkers would walk around the office to avoid their desk. Just so many subtle ways that negative attitudes about mental illnesses could be conveyed. GLENN HOLSTEN: That’s just so sad. I’m so glad you were able to document those experiences. So much misunderstanding and misinformation. It’s time for people to tell their own stories. GLENN HOLSTEN: This Recovery Diaries website has its genesis in a film I worked on with a man named Bud Clayman. The film is called OC87: The Obsessive-Compulsive, Major Depression, Bipolar, Asperger’s Movie, and depicts the journey that Bud Clayman, in spite of living with the many diagnoses in the film’s title, makes as he realizes his dream of being a filmmaker. In our film we recreate his lived experience of being on a bus, being in an elevator and challenges he faces simply walking down the street. Those scenes are a revelation for people who share those experiences. They tell us that it’s the first time someone has actually shown what they live. And it’s like watching someone walking in their shoes. It’s very exciting to see that energy. I think people are emboldened and strengthened by it. DR. OTTO WAHL: That’s one of the reasons I say that’s a very important thing to do. GLENN HOLSTEN: You’ve been doing this work for a substantial amount of time. The book Media Madness: Public Perceptions of Mental Illness recently had its 20th anniversary. I would be very interested to hear your observations about how the media has either evolved or devolved over that time frame. What are your sort of big thoughts about that? DR. OTTO WAHL: I think there has been improvement. I think it is somewhat easier to find more positive, more respectful presentations in entertainment media and in news coverage. But the same negative themes, still remain. They haven’t gone away. 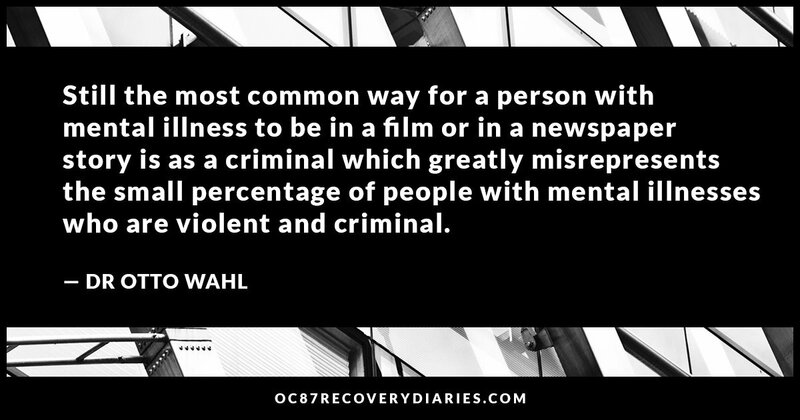 They’ve improved somewhat, but still the most common way for a person with mental illness to be in a film or in a newspaper story is as a criminal which greatly misrepresents the small percentage of people with mental illnesses who are violent and criminal. That said, I also see a great many more efforts to address the issue than I did when I wrote that book 20 years ago. There’s a lot more research on stigma and how to combat it. There is a lot more support for research. There’s a lot more research on how the media present it. There are organizations that work with the media to try to help them to do a better job of depicting and covering mental illness. I think all of those things are positive developments but there still is a long way to go. GLENN HOLSTEN: Do you have thoughts about what would be a very inspiring action that people could take that could help us move forward to that? What do you think it’s going to have to take to make change that’s needed so that these misconceptions don’t exist anymore? DR. OTTO WAHL: Well, there are several strategies — one of which is one that you’re involved in — and that is the voice of the millions of people with mental illnesses who are being portrayed needs to be heard. I can express my concern, as I often have, to media people. But I am a mental health professional who has an ax to grind. I’m someone who’s speaking second hand about this. When people with mental illnesses can stand up and say, “This hurts me” and “I object to this and I’m not going to stand for it” that’s not just an academic concern for accuracy, that’s individuals or some organization of people with lived experiences. I think both of those are extremely important. I also think education is very important. A few years ago there was an addition to the Associated Press Stylebook on how to cover mental illness. That was a nice step forward. They added a number of things to their code of how you cover things. Mental illness had not been in there before. I think that one of the organizations that I worked with for many years, the Carter Center’s Rosalynn Carter Fellowships for Mental Health Journalism program is a great step forward. We’re now seeing many more well informed thoughtful pieces about mental illness than we had in the past, in part due to that fellowship. GLENN HOLSTEN: In terms of popular media, are there any great success stories that you can point to of the recent picture that you think really got it right, that you feel indicates this kind of progress? DR. OTTO WAHL: Actually there is an organization called the Entertainment Industries Council, you might check that out our website. It’s actually an organization of both mental health professionals and media professionals in Hollywood. Among other things what they do is to give awards to positive portrayals of mental illness every year in a big Hollywood style red carpet event. This year I nominated somebody because I thought it was pretty good which was an episode of Blue Bloods. Blue Bloods is a police show with Tom Selleck as the police commissioner. In this particular episode there was a young woman with mental illness who was behaving erratically on the street. One of the young officers (who happens to be the son of the police commissioner) intervenes and talks to her, rather than arrests her, and tries to help her throughout the show. By the end of the show, he is lobbying with his father, the commissioner, for better training of police officers for dealing with people with mental health problems. I thought it provided a very good model of de-escalation when you deal with people and of addressing the issue of police training when it comes to that. That would be an example for me of one of the more positive portrayals I’ve seen. Now, even within that positive portrayal, I have to say there was violence associated with mental illness. The young woman becomes frightened and confused and actually cuts her father with a knife. She’s not this threatening character who’s stalking people, as is too often the case. GLENN HOLSTEN: What an interesting example. It encapsulates where we are right now. DR. OTTO WAHL: I think it showed that they cared about this young woman. They cared about the family. Unfortunately, it also had a tragic ending, the young woman committed suicide before they were able to get her help which also led to discussions about inadequacies in the mental health care system. GLENN HOLSTEN: Wouldn’t it have been awesome if instead of suicide, she was shown on a path to recovery? I was wondering if you had any thoughts about images of recovery in the media and how that topic might have changed over the years. DR. OTTO WAHL: I do have some thoughts about that based on some data we collected, and rather than talking about how they changed over the years, most of the findings suggest that recovery is seldom talked about. 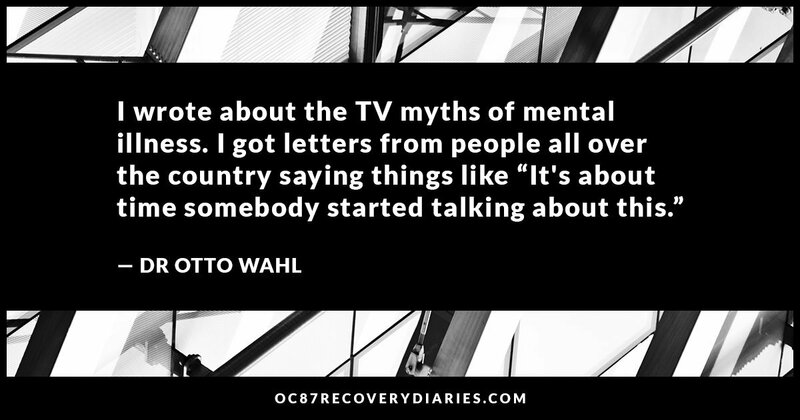 DR. OTTO WAHL: We did a couple of studies, both of newspapers and films and television, and most of the time that a person with mental illness is presented, there is very little information given about that person’s recovery. Particularly in entertainment media. When a person with mental illness appears, they very seldom get better. GLENN HOLSTEN: What do you think the repercussions of that kind of thinking are in the public’s perception of recovery possibilities? DR. OTTO WAHL: That’s the kind of thing that fuels general fears about mental illness. What that says is that when others know that someone has had a diagnosis of mental illness, they may think “Well, that person never gets better.” And if that’s the case, then they’re always (in the public’s mind) volatile, ready to fall apart at any time, fragile, and are unable to handle work assignments and things like that. It undermines recovery, it undermines people being able to move beyond a patient status to taking on responsible roles in society. GLENN HOLSTEN: It’s interesting, in the film that I’ve just worked on there’s a man who says “I’m not my diagnosis.” It sounds like that’s what you’re talking about. DR. OTTO WAHL: Yes. It’s that kind of thing. Having said that, there are some excellent films that are inspiring stories for people who have overcome those kinds of challenges, but those are relatively rare. The run of the mill presentation involves people who are fairly deteriorated, who are violent and criminal, and the message is that the only way to deal with such people is to incarcerate them forever, because they’re never going to get any better. Which fuels the public’s support for forced hospitalization.